Today, our destination was Williams for the second of our rest days but our first stop was the Petrified Forest National Park. Again, we were given a fixed time to wander around and take photographs before meeting up at the end of the road. We could have easily spent more time here and we’re conscious we only saw a fraction of what was there but this was a Route 66 tour and not a National Parks tour so we had to make the best of the time available. As it turned out, the first couple of stops gave us fantastic views of the Painted Desert and we spent so much time taking photographs that it left us no time to see the petrified trees. In fact, we jumped on the bike and rode through the park bypassing other areas of interest and made it to the rendezvous point with just four minutes to spare. There are several shots of the Painted Desert in the Photo Gallery for today, maybe too many. Our lunch stop was Joe and Aggie’s at Holbrook and we heard that they were expecting a large Norwegian tour party that day. Gary suggested that we made our way there promptly in order to get served before the others arrived. Joe and Aggie’s dates back to 1946, the year when Bobby Troup headed west in his Buick convertible and wrote (Get Your Kicks on) Route 66. The food is a cross between Mexican and American and is rated highly. Not being fond of anything too spicy, I went for the Hot Beef with Mash and Gravy which actually was quite tasty and very much in a home-cooked style. It made a welcome change to the usual predictable menu choices found in so many other diners. Just down the road from Joe and Aggie’s is the Wigwam Motel. It is decorated with classic cars in front of them (though mostly not restored) and, apparently, the hotel is still in use today. The sign at the front challenges “Have you slept in a wigwam lately?”. These are not real wigwams but motel rooms made to look like wigwams and they have all modern facilities inside. I spent a while photographing the ‘wigwams’ as well as the vehicles here. Our next stop was Winslow made famous by The Eagles with Take It Easy. It was their first single and was released on 1st May 1972. It was written by Jackson Browne and Glenn Frey, lead singer for the Eagles. It’s not clear whether Glenn Frey stayed in Winslow and got his inspiration from there. Winslow was the largest town in northern Arizona but suffered badly when Interstate 40 was opened. It became one of the many ghost towns along the old route. The La Posada Foundation (now called the Standin’ On The Corner Foundation), determined to revitalise Winslow, decided to create a park in Winslow focussed on Take It Easy. They purchased some land with a building on the NW corner of Kinsley Avenue and Second Street, created a park, commissioned trompe-l’œil artist John Pugh to paint a mural on the side of the building, and sculptor Ron Adamson to create a bronze of a 70s man with a guitar to stand on the corner. The mural also depicts a girl in a flatbed Ford thus echoing the lyrics of the song. The building was destroyed by fire in 2004 but the wall and the mural were preserved – the rest of the building was subsequently torn down. 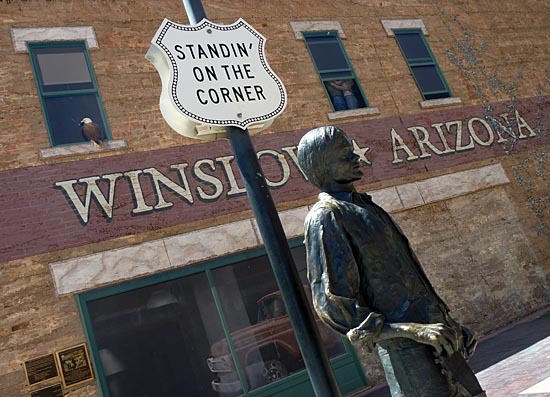 Though the song refers to a corner in Winslow, Arizona, there is no evidence to suggest that this corner is the one (if Glenn Frey ever had a particular corner in mind when he penned the words of the second verse) but the tribute itself is enough to bring tourism to the town and help it survive. While in Winslow, we buy long-sleeved t-shirts in case we need them for the ride through the desert. We have cool vests but buy them anyway to give us some options. Besides, it’s nice to have a Standing on the Corner in Winslow, Arizona t-shirt. Next is a longish stretch of Interstate. We see in the distance what appears to be low cloud drifting northwards. It appears more like volcanic activity creating an ash cloud the closer we get. It turns out to be a forest fire on the hillside in one of the national parks near Flagstaff. Roads are being closed and traffic queues forming as the fire spreads. Gary decides to bypass Flagstaff and go straight to Williams. We stop off at the Grand Canyon Harley-Davidson dealership for a break. This is a large dealership split into two buildings. One houses the showroom while the other, across a large car park, houses a Route 66 museum and a bar/diner. We get a coffee there and take some photographs. I made my way over to the showroom to find Bill trying the bikes again. I purchase a cooling neckband for Françoise whose neckband has disappeared (Gary later finds it buried below the ice in one of his ice chests). We eventually make Williams as the sun goes down and gives a golden glow to the town. We rush to the hotel to freshen up and get out again with our cameras before all the light is gone. The hotel is one of the few with decent guest laundry facilities and one where we arrive before EagleRider and thus have a chance to use the facilities. Gary gave me some laundry detergent and I put a load into the washer. It needed $1.75 in quarters. The dryer takes the same and it is a relief to get some washing done at this stage of the trip. Others have been buying t-shirts as they went along and presumably washing other things in their rooms. The walk to the centre of town takes about 20 minutes. There is a staged gunfight happening and I stop to speak to a couple of musicians while they took a break. The mayor of Williams was also there and I get his photograph. I wander further down the road taking several pictures along the way. I stop at John’s Auto Truck business and ask if I could take some photos. I was refused. I got talking to them, explained who I was, talked about Williams and Route 66 and then eventually they (John, the owner, and his father) permitted me to photograph them. They ask for copies and give me their business card – I will send them prints from England. We eat that night in Doc Holliday’s, the bar attached to the hotel restaurant. The food is OK but not the best. Certainly, Françoise was less than happy with her ribs. The group watch Wild Hogs on the bar TV. The film is based in Madrid where we were the day before and we recognise places we had seen. We go to bed looking forward to our trip to the Grand Canyon the next day.